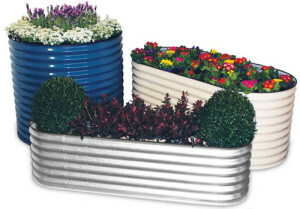 Gardeners Watertanks’ raised Gardening Beds are made from high strength steel, with an internal food grade polymer lining for long life protection. This is a great lightweight alternative to treated pine, which can contain toxic chemicals, hardwood which is expensive and rock or concrete panels which are heavy and cumbersome. The top edge of the raised Garden Beds has been formed over to ensure there are no sharp bits when gardening the beds. The joins are machine riveted, making them durable and long-lasting. Your garden bed is delivered ready to use, there is no assembly required. Gardeners Watertanks has the widest range of sizes in Australia, all tested and engineered to support the weight of the soil. Our raised Gardening Beds are easy to install and can be positioned anywhere, as no assembly is required. Raised Gardening Beds are made in the true Colorbond® colours, Pale Eucalypt, Paperbark or plain Galvanised, designed for its durability and excellent weathering qualities. We provide a 5 year structural warranty on all raised Garden Beds. 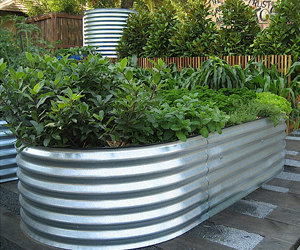 There are no limits when it comes to the uses for our raised Garden Beds. They can be set up for vegetables, herbs, potted colour, formal gardens or create your own compost bed. Raised gardening also offers many benefits, such as improved soil conditions, higher yields, ease of access and better pest control. The raised Garden Beds are wonderful for children, people with bad backs or the disabled, as no bending is required to tend the plants. Garden Beds are also ideal for small courtyards or patios. Our beds allow for natural drainage and worm movement. All our raised Garden Beds are 100% recyclable. You can download the price list for Garden Beds here (223kB). • Delivered complete, no assembly required. • Steel construction for high strength. • Quick and easy to get your garden started. See the instruction guide here. • Good drainage, promoting healthy roots and worm movement. • Made to measure, so you get the perfect size for your garden.